In Snowblind: Race for the Pole, you will lead a team of polar explorers in a desperate race to reach the South Pole and return alive. Each turn you will need to carefully consider your supply chain of crates and food, and the protection of your team against the arctic elements. Too much caution and you will never reach your goal before the dreaded pack ice returns. 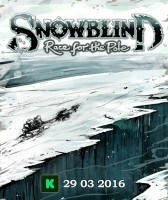 Add a Review for "Snowblind: Race for the Pole"